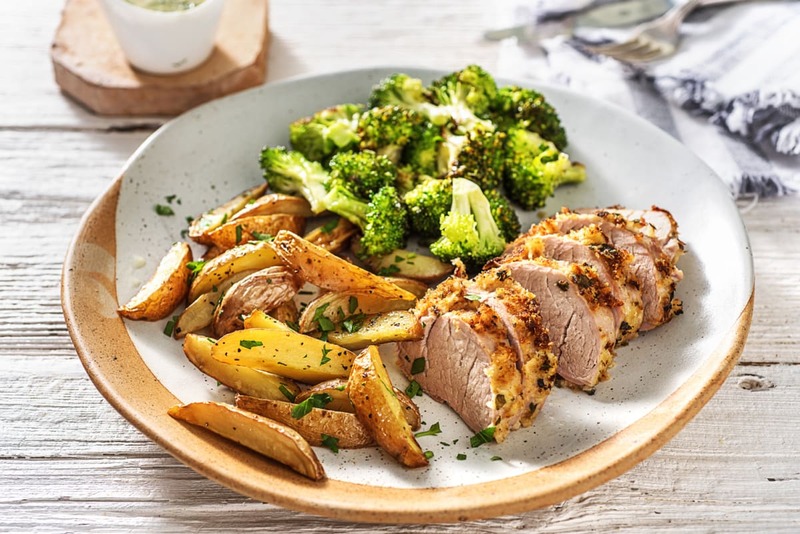 Super simple to throw together and packed with flavour, this crusted pork loin is a star. 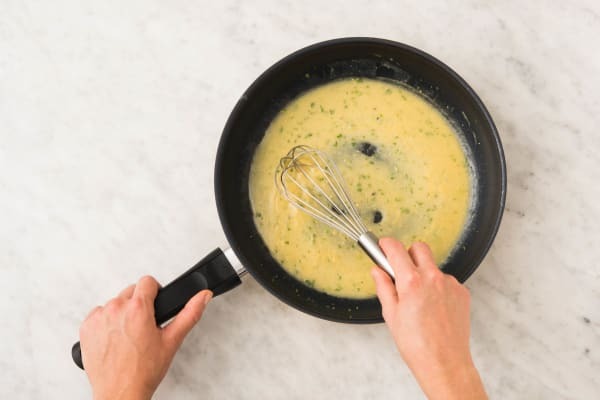 The crisp broccoli and tender, golden potatoes are complemented perfectly with a tasty pan sauce. Best part? It will all be on your plate in no time! Preheat the oven to 450°F (to roast the potatoes and finish the pork). Start prepping when the oven comes up to temperature! Wash and dry all produce. 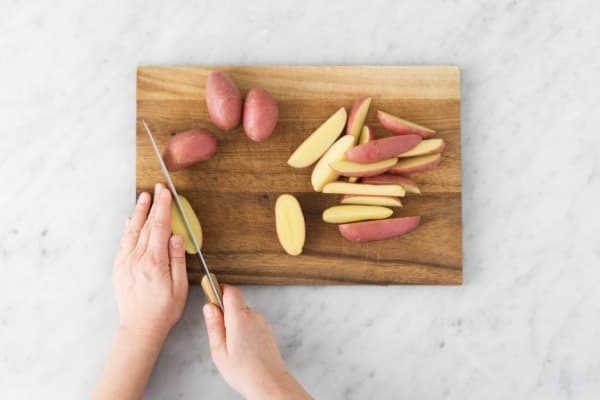 * Cut the potatoes into 1/2-inch wedges. 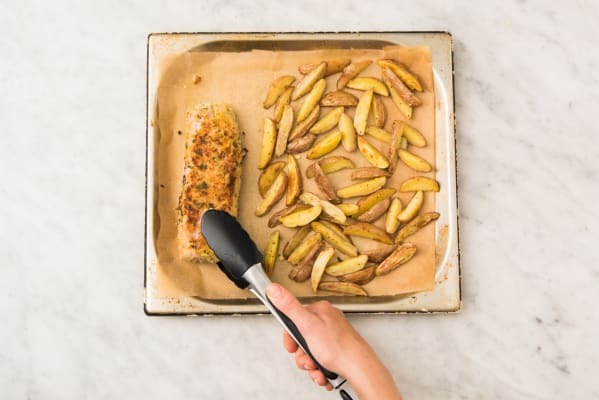 On a parchment-lined baking sheet, toss the potatoes with 1 tbsp oil (dbl for 4 ppl). Season with salt and pepper. Roast in the middle of the oven, until the potatoes are golden-brown, 25-28 min. Meanwhile, finely chop parsley. Finely chop 1 tbsp oregano leaves (dbl for 4 ppl). Cut any large broccoli florets into bite-size pieces. In a shallow dish, combine panko and 2 tsp oregano (dbl for 4 ppl). Set aside. In a small bowl, stir together 3/4 tbsp honey (dbl for 4 ppl) and 1 tbsp mustard (dbl for 4 ppl). Set aside. Pat the pork dry with paper towels. Season with salt and pepper. Continue roasting the pork and potatoes in centre of the oven, until pork is cooked through, 14-18 min. (TIP: Cook to a min. internal temp. of 71°C/160°F, as size may vary. **) Meanwhile, carefully wipe the same pan clean. Heat pan over medium-high heat. When pan is hot, add 1/2 tbsp oil (dbl for 4 ppl), then the broccoli. Cook, stirring, until tender, 4-5 min. 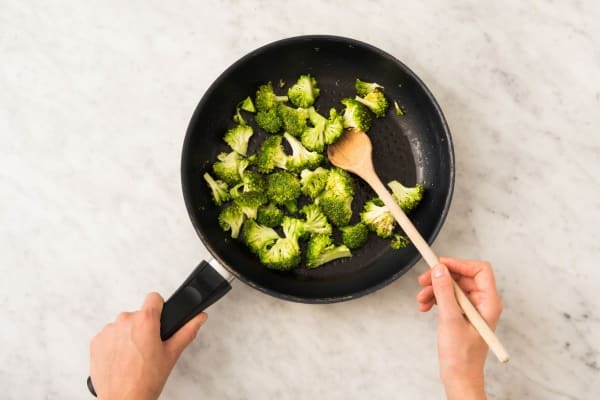 Remove pan from heat and transfer broccoli to a plate. Cover and set aside. Wipe the same pan clean. In a small bowl, whisk together 1/2 cup water (dbl for 4 ppl) and 1/2 tsp cornstarch (dbl for 4 ppl). Set aside. Heat the same pan over medium heat. When pan is hot, add 1 tbsp butter (dbl for 4 ppl). Swirl pan until the butter melts, 1-2 min. 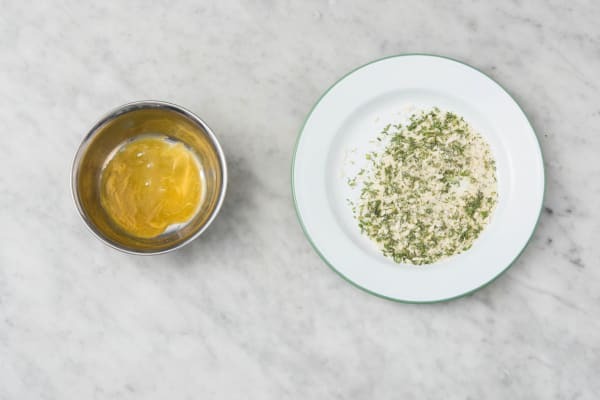 Add broth concentrate(s), cornstarch mixture, remaining oregano and remaining mustard. Cook, whisking together, until sauce reduces slightly, 2-3 min. Add half the parsley and stir together. Thinly slice the pork. 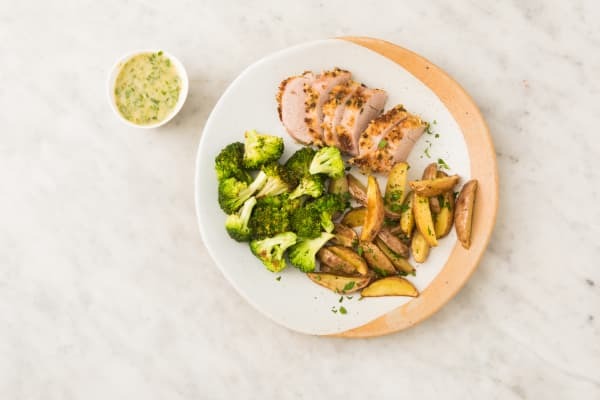 Divide the pork, potatoes and broccoli between plates. Sprinkle the remaining parsley over the potatoes. Serve the pan sauce on the side.